Electronic identification upgrades your flyable parts to smartness. Air transport is a complex business. Airports, airlines, aircraft manufacturers, parts suppliers and maintenance organizations must coordinate their activities to make operations safe, efficient and profitable. FLYtag® is an approved electronic identification system that improves aircraft turnover and minimizes operational disturbances. The Air Transport Association (ATA), the trade association for airlines, expanded guidelines for component parts tracking in ATA Spec 2000, with recommendations for automating part traceability using RFID in Chapter 9.5. RFID technology provides real-time value chain visibility into the manufacturing plant and throughout the service life of the component, including maintenance, repair and overhaul. All relevant data is always readily available as parts, systems and aircraft are assembled, inspected, placed in service and maintained over decades. FLYtag® manager incorporates the latest ATA Spec 2000 Chap 9.5 standards including and Dual/Single (1 Kbit / 2 Kbits) and Multi record (8 Kbytes to 32 Kbytes and up). It includes the four ATA banks – Birth Record, Current Data Record, User ScratchPad record and Part History Record – as well as the EPC bank as defined in TDS 1.11. With FLYtag® manager, suppliers meet all manufacturer RFID part marking requirements (Airbus, Boeing, Eurocopter, etc.) for tracing flyable components across their full lifecycle. FLYtag® manager offers multiple deployment options for suppliers and their enterprise back-office systems. Each FLYtag® needs to be initialized with manufacturer data. This dataset is called the “Birth Record’’. Birth Records can be recorded to a FLYtag® by pushing the “Bind a new tag” button in the FLYtag® manager main menu. Birth Record data can also be scanned with the handheld computer barcode reader. Part History Records are used to record significant maintenance actions involving the part. Information about these actions is entered by users during each step of the maintenance process. Part History Records cannot be rewritten once data is inputted, but new Part History Records can be added during the tag’s life by clicking on Add. Current Data Records provide the most up-to-date information about parts, and users almost always rely on them for basic analysis. Rewritable, they are copied to files at every writing. ScratchPad records are rewritable and never locked or read- or write-protected. They are available for users to read or write all useful information about a component. Two pieces of data (ACO and ACD) are always included to indicate the date and author of the information being recorded. There is also a field for comments/remarks. FLYtag® manager comes with a powerful data synchronization module running on Windows® PC to store and manage data in open-source format (XML). FLYtag® manager is compatible with most middleware on the market. For more information about approved middleware, please contact our support team at: support@maintag.com. 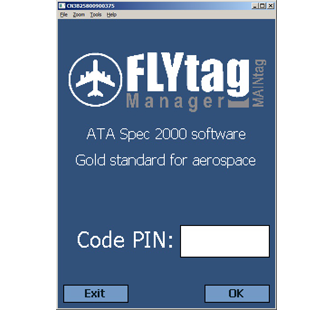 FLYtag® manager is the world’s leading ATA Spec 2000 software, replacing paper with electronic records: a machine-readable datasheet that records all information listed in the paper form and can be digitally signed to ensure the authenticity and integrity of the content.